Come on! Share with the forum your color palettes! 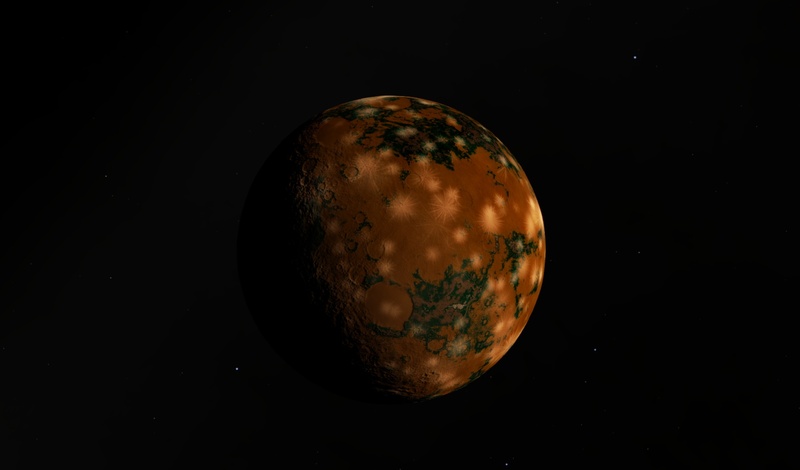 Each planet in SE have a parameter "Style" calculated procedurally. In a palette, you can choose the range of style the planet should have to have a certain style. The more the range is small, the more the palette will be rare. At the end, all the styleranges of the palettes of a planet class should recreate [0,1]. Where do we place these incredible new palettes? thanks. where i need to put this? I wonder if colors like that could exist in real life. I tried doing my own color palette (for Desert planets), that is supposed to resemble Venus' colors. Can anyone tell me if this planet is using a default color palette or not? Pardon my inexperience at programming, but I have a question regarding the color parambeters. I assume the four values are R (red), G (green), B (blue), and A (alpha); but in what order are they used here? RGBA? BGRA? And does rising alpha INCREASE, or DECREASE, transparenzy? And you can use the planet editor to fiddle with the SurfStyle and OceanStyle sliders to switch between palettes. but in what order are they used here? RGBA? BGRA? And does rising alpha INCREASE, or DECREASE, transparenzy? RGBA, and it works just like it would in any image editor. 1 = 255. So if a value of 255 in the alpha channel gets you an opaque image, then it does the same in SE. Note, however, that alpha doesn't actually control transparency, but specular reflections; higher alpha means stronger reflection, so most of the time you'll want the alpha to be 0. Also, I love some of those gas giant colors Toty! It now has a 1% chance of being used in my copy. Wow, these are all very nice. That first (blue/white/tan) gas giant is incredible. Fantastic, I didn't know you could do this. I'll get to making a few myself. SE generates a Style value - a random number in a range of 0.0 to 1.0 (for example, Style = 0.435), after this it scan through palettes of current planet's type (for example, gas giant) and found first palette, which StyleRange includes generated Style (for example, if palette have a StyleRange (0.40, 0.50), this Style = 0.435 is fit in it and SE chooses this palette). So to make system working, you must have a list of palettes which StyleRanges making a continuous series from 0.0 to 1.0 and without holes and overlaps. For example, (0.0, 0.3) - (0.3, 0.5) - (0.5, 0.7) - (0.7, 1.0). If StyleRanges will overlap, SE alwaus will choose first palette in the config, if there will be a hole in ranges, behavior will be undefined, if palette will have zero StyleRange width (for example, (0.0, 0.0) or (0.4, 0.4)), it will be completely ignored.